We thought that we would write about biogas compressors, their purposes, design requirements and suppliers. It is a product which is quite new and there is a growing market for these specialized compressors. There is an increasing demand for greater sophistication in the design of biogas plants, now that the many benefits from anaerobic digestion are becoming better understood globally. The result is that many installations will need a biogas compressor, and we decided to make a video, to present the subject. At the high-tech end of the biogas industry are the large biogas plants which are increasingly being used to produce purified biogas at a very high quality, and that is called “biomethane”. Methane (biomethane), does not liquefy at low pressures in the way that propane and many other hydrocarbon gases do. This makes it necessary to compress it to higher pressures, and that makes it harder to compress. Biomethane for grid injection needs to be compressed in a special biogas (biomethane) compressor at a pressure suitable for it to be injected into the natural gas-grid. This is usually called “upgrading” and the biogas compressor for this application is designed to raise the gas pressure to grid distribution pressure. Biomethane, is also a great vehicle fuel for the replacement of LPG and CNG, but for equivalent calorific value must be compressed to higher pressures. Compressors for this purpose, raise the pressure of the gas to a pressure suitable for selling it in compressed gas cylinders. There are also biogas compression systems that at the lowest level of the technology which simply comprise weights placed on the top of biogas storage tanks. The weight on the biogas storage container, in such designs, is simply provided to be sufficient to push the biogas through pipes to the kitchen where it will be used. Most people looking for a biogas compressor will be looking for high-tech versions to provide much higher compression. Biogas Compressors can be piston based, screw type, vane type, or liquid ring type compressors. There are a number of suppliers, such as AERZEN, TECNO PROJECT INDUSTRIALE, Avelair, and Bio-komp. 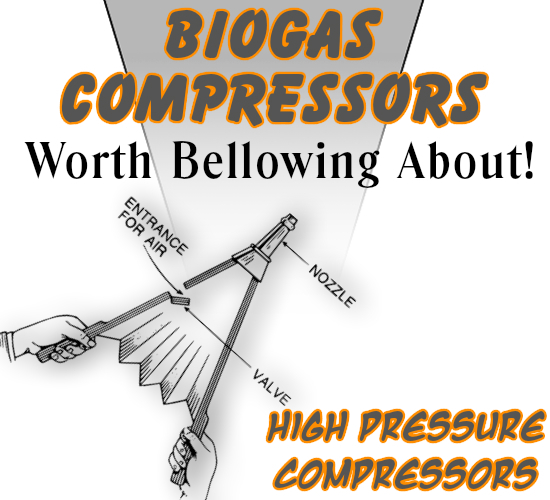 We hope that this has provided you with useful information about biogas compressors. 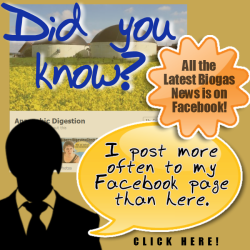 Visit our web site at anaerobic-digestion.com for more biogas information. You write that biomethane is a great replacement fuel for compressed natural gas, but that it needs to be compressed to a higher pressure for equivalent calorfic value. Does this mean biomethane is less energy dense? Thanks. Yes. That is correct. In the UK when biomethane is injected into the natural gas grid,it has to have an additional fuel added to raise the calorific value, because higher compression is not possible. The fuel added is propane, but of course this has a negative effect on the green credentials of biomethane. Good writing. This is high quality blog. Offering you a complete choice of products which include biogas compressor and bio gas compressor.